Home Pieter Jacobus Conradie: An appreciation. Pieter Jacobus (Piet) Conradie was born on 7 February 1931 at Grahamstown. After matriculation from Hoërschool Nassau in Mowbray he studied Classic Languages at Stellenbosch University (BA, BA Honours, MA, 1963 - 1969). He continued his studies at the University of Utrecht, Holland, where he obtained a PhD in 1958. Title of dissertation: Herakles in die Griekse Tragedie. On his return he was appointed lecturer in Classical languages at Stellenbosch University and, in April 1974, promoted to Professor of Greek. He retired in 1994. His special field of interest is Greek myth and tragedy, especially its influence on modern literature, includig English medium African literature, and he has published a number of articles on these topics. 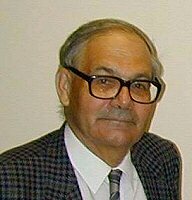 Piet Conradie was an active member of of the Classical Association of South Africa and national chairperson (1975-1976). He was editor of the classical journal Acroterion from 1987 to 1995.